Do super-tides kick start interglacials ? | Watts Up With That? Do super-tides kick start interglacials ? It is proposed that for the last 800,000 years super-tides caused by maxima in orbital eccentricity have been the key factor needed to break up large northern ice sheets to enable the 41,000 year insolation cycle to initiate an interglacial. Insolation alone was sufficient to melt back the ice sheets over the previous 4.4 million years, as observed by the long series of 41,000 year glaciation cycles in the LR04 Do18 stack. The obliquity cycle was broken once an underlying cooling trend had increased glacial ice sheet extent beyond a threshold for “Milankowitch” summer melting. Since that time huge tidal forces amplified by increased eccentricity, have been required to bring a glacial cycle to an end by carving and shelving the ice sheets. Once initiated a rapid deglaciation proceeds due to enhanced insolation with positive albedo feedback, resulting in a sawtooth shape. The most exceptional tides occur when the perihelion of the sun and the moon coincide and both orbits are at maximum eccentricity. This process can explain both the origin of the 100,000y cycle of ice ages and the transition from earlier 41,000y glaciation cycles which have so far remained a mystery. Fig 1a. 5 million years of benthic foram dO16 data. 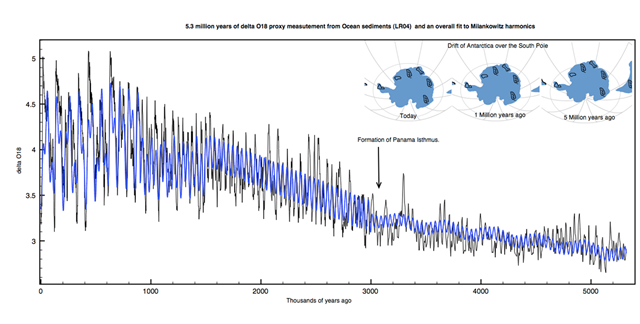 The blue curve is a fit to Milankovitch harmonic data described inPhenomenology of Ice Ages. Fig 1c. Correlation of larger obliquity and warmer temperatures. A calculation of the insolation at the poles that demonstrating the dominance of the 41,000 year cycle is shown in Fig 2. Fig 2. Maximum and total solar insolation calculated at the poles during last 600,000 years. The total annual insolation and the N-S asymmetry show the underlying effect of the 41,000 obliquity signal. The basic hypothesis behind this proposal is the following. 5 million years ago a gradual cooling of the climate began (Fig 1a). This was most likely due to plate tectonics. First Antarctica moved further south to sit over the South Pole isolating the Southern Ocean. Second the Panama isthmus closed cutting off circulation between the Atlantic and Pacific. A regular glacial cycle began driven by the 41,000 year change in obliquity of the earth’s axis. Higher obliquity brings higher insolation to both poles modulated by the precession of equinoxes. The 41,000y signal dominates glaciation cycles from 5 million years ago until 1 million years ago. 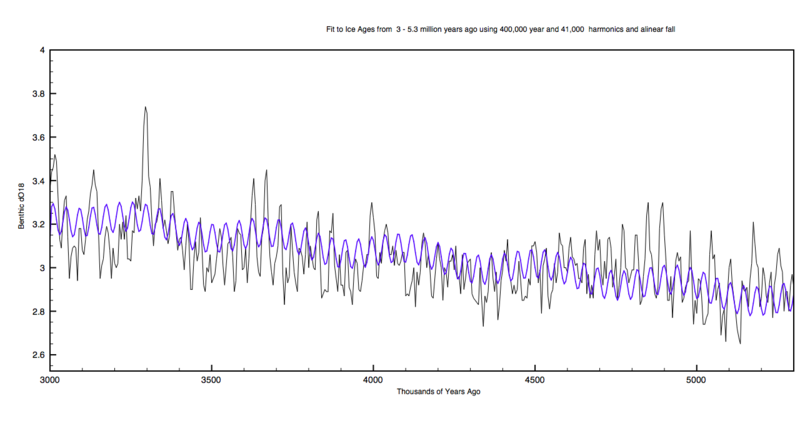 Meanwhile the intensity of glacial periods was slowly increasing as global cooling due to plate tectonics continued. 900,000 years ago this general cooling reached a critical stage because the increase in spread of ice sheets in the Northern hemisphere became too large to fully melt back during the next peak in obliquity. The cycle of 41,000y ice ages was broken. Something else was now needed to trigger ice ages and that something was extreme tidal forces caused by maximum orbital eccentricity. When these coincided with peak insolation in the Arctic Circle the breakup of the northern ice sheets could begin and they collapsed rapidly within one precession cycle. § Perigean Eclipse Tides (PET) which occur every 2.99847 years which is when a Perigean spring tide coincides with the Earth-Sun-Moon all aligned in the ecplitic plane. The lunar and solar tides then pull directly together on the earth rather than through a cosine(declination) offset. § Finally there are Super Perigean Eclipse Tides(SPET) which occurs every 1832 years. This super tide occurs when a Perigean Eclipse Tide coincides with the earth also at perigee in its orbit around the sun so that the solar tide is also at its maximum value possible. These rare events cause tidal forces some 30% above normal. There is also a 5000 year modulation in the strength of SPET. Now consider what additional effects variations in the “Milankovitch” cycle of eccentricity would have on these Perigean tides. The 100,000 and 400,000 year cycles in the ellipticity of the Earth’s orbit are caused by regular gravitational effects of the other planets as they orbit the sun, particularly those of Jupiter and Saturn. Every 100,000 years the orbits of Jupiter and Saturn align themselves so that their net gravity perturbs the Earth’s orbit causing it to elongate and become more elliptical. This cycle reaches a maximum every 400,000 years in regular fashion. The gravitational force of the sun on the moon is more than twice that of the Earth. For an observer in outer space the moon appears to orbit the sun just like any other planet. Its orbit is perturbed by the Earth’s gravity making it slightly concave. It is only from Earth that it appears to us to be in an elliptical orbit around the Earth. The moon’s orbit is therefore also affected by the gravitational pull of the other planets inducing a similar (Milankovitch) variation of eccentricity in its orbit around the sun. However this also causes an increased elliptical orbit of the moon around the earth because they have different mass. The largest solar tides are up to 20% higher than those we experience today. I have been unable to find any information about Milankovitch calculations of effects of the lunar orbit but I will assume a proportional increase to that of the earth. Given that assumption we can look at the more important lunar tide. January 14, 2014 in Climate News, Paleoclimatology. We can measure this hypothesis in how many years? Keeling’s paper is outstanding. And makes a lot more sense to me. If correct, we are on the verge of another big Cold Spell lasting decades. Three rounded rocks with circles. The old ones following the sun and moon cycles. These old ones lived out in the open, they slept out in the moon light. They knew some things, possible more than Michael Mann and his tribe. I thought interglacials were caused by continential drift. But it’s good to have alternate theories too. I look forward to the Day when all theories are thrown out the window and we collectively say to ourselves. “Oh.. So that is what causes Humanities extinction.” By Ice or by Fire it matters not. That the large changes to Earths climate are cyclical like clock work, one can only conclude that the answers lay in the cosmos. The coinciding alignments of our solar system and our place in the galaxy seem overwhelmingly to be the cause. The mechanism or mechanisms that cause the swings are open to conjecture. Astrology this is not, but some basic premises of astrology coupled to astronomy may explain why the ancients were so enamored by the concept. Notwithstanding that the mechanism is not known, this knowledge can give us some predictive skills. Fathoming the mechanism may take some time, as it is not just climate science that has succumbed to consensus. Some very interesting points made in this paper. Along the same lines its interesting to note that over the period of 1991-2011 there were 7 ‘supermoon events’ where the moon orbits closer to the earth than is usual, when usually there is only 3 such events in any 20 year period. It so happens that in this time period we have also witnessed the thinning of the Northern Ice Cap, so this paper would explain that behaviour much better than the missing heat scenario. I think its highly likely that these variations in the orbits of our planetary system is the main factor in all global, and most local geological and atmospheric events. Why? I’ve been following this issue for the better part of a decade, The staggering amount of information we don’t know, yet pretend we do to a remarkable tenth’s of a degree spanning 100’s of thousands of years. Getting tiring. Like to get it over with sooner or later..
this certainly seems to be on the right track.it has always puzzled me why there was not more investigation into the HUGE effects caused by the masses of the oceans movement variation depending not only on tidal range,but the changing areas where the greatest gravitational pull is. this is most likely the main cause of shifting ocean currents,and of their variation in strength in recent times. it would be interesting to see a plot of the various oceanic oscillations over the same timescale if that is possible. The key to understanding the glaciation cycle is to understand that, while orbital variations don’t cause large changes in the “global average TOA radiative forcing” they cause significant shifts in the seasonal and latitudinal *distribution* of solar insolation. It is likely that this (and things like changing geography) act on the climate system by their effects on dynamics, the atmospheric circulation, and in turn, clouds. This allows such factors to give rise to changes in the mean climate state, without a need to appeal to global radiative forcings like CO2, and without the sensitivity to such being high. This, moreover, is why such changes have typically involved tropical climates not much different than the present, but polar climates *dramatically* different. Changes in the meridional heat transport as induced by such heterogeneous forcing-this would naturally arise, given the above, when combined with a strong negative feedback in the tropics. In that regard it is worth noting that, at least according to CLIMAP, there were even parts of the tropical Pacific ocean that were actually *warmer* than the present during the Last Glacial Maximum. Of course, changes in ocean circulation could cause a similar effect, and would probably be related. The idea that ocean tides break up large floating ice-sheets runs afoul of considerations of spatial scale. There is scarcely enough difference in tidal elevation over the typical dimensions of such ice-sheets (tens of kilometers) to exert the forces necessary to fracture them. Only in the case of ice-sheets fastened to shore is such a mechanism plausible. “…..that something was extreme tidal forces caused by……” Or maybe an asteroid hit an ocean. Or maybe an mile high avalanche of ice and rock cause a tsunami. Just not enough information yet. Which reminds me whether global warming kick starts ice sheets growth? Will greenhouse warming lead to Northern Hemisphere ice-sheet growth? ALTHOUGH model simulations predict a higher mean global temperature by the middle of the next century in response to increased atmospheric concentrations of greenhouse gases1, the response of the cryosphere to specific changes in latitudinal and seasonal temperature distribution is poorly constrained by modelling2,3 or through instrumental measurements of recent variations in snow cover4and ice thickness5,6. Here we examine the recent geological record (130 kyr to present) to obtain an independent assessment of ice-sheet response to climate change. The age and distribution of glacial sediments, coupled with marine and terrestrial proxy records of climate, support arguments that initial ice-sheet growth at the beginning of the last glacial cycle occurred at high northern latitudes (65–80° N) under climate conditions rather similar to present. In particular, the conditions most favourable for glacier inception are warm high-latitude oceans, low terrestrial summer temperature and elevated winter temperature. We find that the geological data support the idea that greenhouse warming, which is expected to be most pronounced in the Arctic and in the winter months, coupled with decreasing summer insolation7 may lead to more snow deposition than melting at high northern latitudes8 and thus to ice-sheet growth. See my last comment. The game plan of Warmists is to have a paper ready for any eventuality so they can point to it as backing their crazy ideas. Whether the IPCC agrees or not is (at that point in time) irrelevant. Same for the endless model runs.This is a scam and people must try and see through it. ‘to an end by carving and shelving the ice sheets’ = calving? I agree with Old Construction worker. What is heartening is that despite the consensus, real science still is happening. And perhaps we will overcome the handicap of the meme. >> The most exceptional tides occur when the perihelion of the sun and the moon coincide and both orbits are at maximum eccentricity. …the perihelion of the sun and moon? …both orbits? If I didn’t already know what you were talking about, I would have no idea what you were talking about with that sentence. I would quantify the insolation caused by orbital eccentricity. 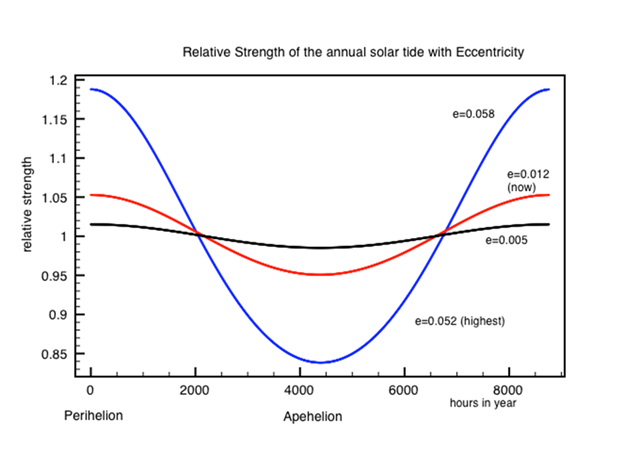 That it does increase insolation is seen with a simple thought experiment: imagine the greatest eccentricity such that the Earth grazes the Sun once a year, with apehelion of twice the average orbital radius — we would all vaporize at perihelion. This is because insolation goes as the inverse square of the Earth-Sun distance, so perihelion is hotter than the apehelion is cool. 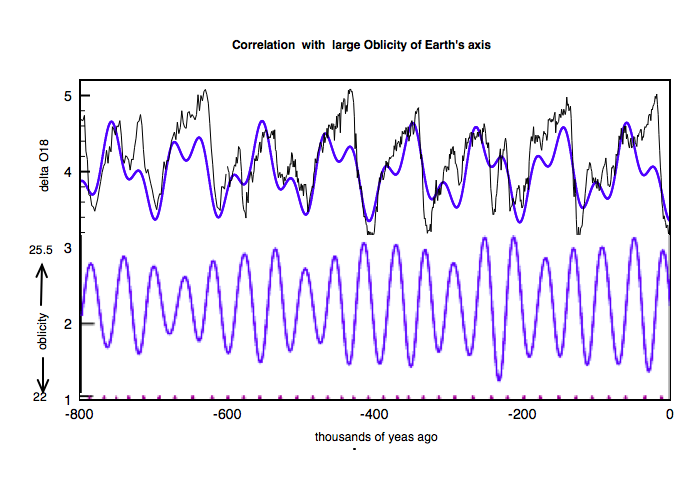 So quantify this to see how much of the 41,000-yr temperature variation is accounted for. Already done, I suppose, but not seen in this article. This is just another example where fanciful explanations of Arctic warming abound, all for lack of knowledge that I provided a full explanation in 2011. Arctic warming started at the turn of the twentieth century, after two thousand years of slow, linear cooling. It halted for thirty years in mid-century, then resumed, and is apparently still active. I say apparently because this year’s ice cap was twice the size of last year’s icecap. Remembering the previous mid-century halt in warming, we must keep in mind that what has happened in nature before can happen again. When the warming first started there was no increase of atmospheric carbon dioxide and this rules out the greenhouse effect as its possible cause. The only logical cause left is a rearrangement of North Atlantic currents at the turn of the century that started to carry warm Gulf Stream water into the Arctic Ocean. The warming pause in mid-century would then correspond to a temporary return of the previous flow pattern. You can download my paper from Climate etc. web site. I suspect the major effect of the tides on climate is to alter the mixing rate of the oceans, bringing more (or less) warm water to the polar surface, as well as to alter the circulation between northern and southern hemisphere. Any change in the mixing rate is significant, due to the overwhelming amount of thermal energy stored in the oceans as compared to the atmosphere. The larger tides may not lead to increased ice breakup except in shallow water, or in areas where there are large tidal streams. Here we examine the recent geological record (130 kyr to present) to obtain an independent assessment of ice-sheet response to climate change. The age and distribution of glacial sediments, coupled with marine and terrestrial proxy records of climate, support arguments that initial ice-sheet growth at the beginning of the last glacial cycle occurred at high northern latitudes (65–80° N) under climate conditions rather similar to present. so, 130kyr ago there were cavemen driving around in SUV’s. Or were conditions similar simply due to natural variability? In which case our current climate is completely explainable without any human causes required, and our most likely future is glaciation. The problem with the insolation theory of glaciation is that an eccentric orbit does not significantly change the total amount of energy the earth receives from the sun. Thus the 100kyr problem in climate science. Radiative changes are insufficient to explain the peak in glaciation at 100kyrs. However, this problem goes away if one considers that tidal forces also peak on a 100kyr cycle, and the importance of the oceans in determining climate. Celestial mechanics still cause the ice ages, but the mechanism is tidal forces as well as isolation. Thousands of years ago humans used the position of the stars in the heavens to predict the coming of the seasons, long before they understood the cause. Our brains are no larger than theirs. Let us not forget the annual solar apparent declinational tides, and the 27.32 day period lunar declinational tides, that drive most of the global meridional circulation patterns. I started to post the below comment on a thread at the Telegraph. I deleted and didn’t post but I had copied it because this had been on my mind for the last several weeks. Upon reading this post here on WUWT, I believe that there is a fit with this article. Note that this started as a reply to another comment…. There is some more thought to this that I will add in another comment. One wonders what effect these supertides would have on MOC (Meridional Overturning Circulation), which is not driven by thermal processes, but by pure mechanical energy input like tides and winds. To see this it is enough to mention the usual thermohaline explanation is flawed, because dense cold water of high salinity can descend only until the abyss gets saturated, then it stops. Therefore we need another, independent process that supplies buoyancy to the deep. Heat conductivity of seawater is far too small to do that and diffusivity of salts is even smaller by two orders of magnitude, while with no additional input mixing is prohibited by the stable layered structure of oceans. The job is done by internal waves breaking over rugged bottom features at mid ocean ridges and at continental margins of complex geometry, inducing deep turbulent mixing at specific sites. Internal waves themselves are excited by tides and wind driven surface waves, mostly over the Southern ocean. If tidal excitation is increased, the MOC is suspected to get more vigorous, so it would transport more warm saline surface water to the Northern Atlantic to be cooled and sunk there, because it has more room to go to down below. In this process it would warm up the region, which can contribute to the collapse of the surrounding great mid latitude continental ice sheets. Place an ice cube in a glass of water. Stir gently back and forth with a spoon until the ice is melted. record the time. Repeat the experiment, but this time do not stir. Which time did the ice melt fastest? Does this demonstrate that even without any change in insolation, the polar ice should melt sooner in the summer as the tides increase, reducing albedo, and leading to increased warming at the poles? Small comment on terminology: When speaking of generic orbits or orbits of multiple bodies, it is better to state it as periapsis or pericenter than perihelion or perigee (or pericynthion) as the root states what body is in the center (helion – sun, gee – earth, cynthion – moon). Of course most people would have to look the word up since it is so rarely used, so maybe a misuse is better communication. I just read Tim,s comment above. That makes so much sense now. I first had noted this last year during all of the interest on the Nenana Ice Classic and the upcoming ‘predict the Arctic minimum’. The Antarctic trend line clearly showed well spaced steps that made me think of a moon connection. I had a link for lunar positions and it showed that every acceleration was occuring right after an ascending 1/2 moon. Another thought in looking at it was that it was not a regular monthly event, but was intermittent. It does not show for every moon cycle, or there is another force dominant that overrides the effect. The above article filled in a thousand blanks with fresh thought. I had alluded to this in a comment about 3 weeks during the recent icecapades in Antarctica. The reason being that the trend line is again showing the signal over the last 2 months and is currently showing the 3rd progression right now. The 3rd event started at the end of last week per my older comment. The Sea Ice Index is starting to show this next step which should decrease the melt rate and hold the trend line above last years 2012/13 trend line. Given how short the summer is down there, it would seem a good possibility for a strong base into the next regrowth. It could very well highlight the real importance of the Antarctic to the climate system. Congratulations Clive for proposing this very interesting hypothesis. If you are just concerned with the absolute strength of lunar tides on the Earth’s surface, then the 18.03 year Saros cycle and its sub-multiples (i.e 3.0, 6.0, and 9.0 years) are your basic repetition cycle. This is because 223 synodic months = 242 draconic months = 239 anomalistic months. In other words, if a New Moon occurs at perigee near one of the nodes of the lunar orbit [the conditions for a Solar Eclipse], another New Moon will occur at perigee near one of the lunar nodes 18.03 years later. return time for near coincidence of events of this cycle with perihelion is approximately 1,800 year. These are the tidal cycles that Keeling & Whorf propose that effect the World’s mean temperature. My proposal is that it is more important to determine when the peak lunar tides synchronize with the seasons, In essence, I am claiming that the Earth’s climate is most influenced by the time it takes for the extreme Perigean spring-tides to re-synchronize with the Earth’s seasons. On time scales of few thousand years, this is equivalent to determining when the extreme Perigean spring tides re-aligns with Perihelion. [Note: Of course on longer time scales, you would need to account for changes in the ellipticity of the Earth’s orbit, the obliquity of the Earth and the Precession of the Earth’s axis]. The repetition periods associated with the alignment of the Perigean spring-tides with Perihelion (i.e. the seasons) are 20.293, 10.147, 3.796, 1.898, 4.00, 15.00 and 19.00 years. The 4.00, 15.00 and 19.00 year periods come from the re-alignment of the synodic and tropical year. [Interestingly, if you look at all the beat periods of these periods that are shorter than 7 years, you find that they almost perfectly match the observed peak frequencies observed in the periodogram of the SOI index between 1950 and 1997 (Sidorenkov 2000)]. On longer time scales it is better to compare how long it takes for the perigee of the lunar orbit to point at the Sun at (or near) the time of Perihelion. This is 177 years and 1832 years. However, when the Perigee of the Lunar Orbit is pointing at the Sun at (or very near to) Perihelion it does not necessarily mean that the phase of the Moon is either New or Full (Syzygy). hence, we need to ask the question: How do the phases of the Moon re-synchronize with the 177.0 year Perigee-Perihelion Cycle? New or Full Moons that re-occur when the Perigee of the lunar orbit is pointing ta the Sun at (or near) the time of Perihelion are whole multiples of 739 years (i.e. 0.0, 739.0, 1478.0 and 2217.0 years). Now, careful study of the New and Full Moons near 739.0 years shows that the strongest alignment between the phases of the Moon and the 177.0 year Perigee-Perihelion cycle occurs at Full Moon at 739.001 years. This contrasts with the starting phase which is a New Moon at 0.000 years. Hence, it actually takes 1478.00 years (= 2 x 739.00 years) to complete the cycle where a New Moon occurs when Perigee points at the Sun at (or near) Perihelion once again. This makes the long term realignment period for the Perigean spring tides with the seasons = 1478 years, which is very close to the 1470 year periodicity of the DO warming events. Clive, thanks for your excellent work. I believe you have made an important contribution. The earth changes it’s orbit orientation relative to the galactic plane as it goes through the processional cycle. As far as I know, this would be true of all the planets. Most depictions show the orbit leaning to the left and cutting through the galactic plane at a 60° angle. 12,500 yrs from now, it would be shown leaning to the right at a 120°(?) angle. As the solar plane moves directly in or away of the galactic wind (not solar wind), the climate changes. This only accounts for 1/4 of the 100,000 yr. glacial cycle so other aspects of the Milankovitch cycle may explain. Saturn and Jupiter align about every 18-20 yrs. The topic is always interesting to me. Thank you for taking the time to share. Best theory I’ve seen so far. Most of the others theories [see Wikipedia] come across as little more than hand-waving. Topic is interesting. Yes. But before the first point has been correctly looked into, then the question is nothing more than an assumption of the past. There are good geologic evidence for what happened when Pangea and other states of tectonical plates history occured. But linking that and super tidal waves the way the question does, isn’t valid argumentations. Mind you. If you do a proper study on today’s Africa’s Horn, you will be able to see how at least 40 different nature phenomena interacting on tectonical plates. This post clears up some the confusion caused by the discrepancies between scaling chronologies of the GISP2, GRIP and NGRIP ice cores. As can be seen from the second graph in this blog post [that used the NGRIP-based Greenland Ice Core Chronology 2005 (GICC05) time scale] there is excellent agreement between the timing of the DO events and the rapid rise in polar temperatures. Something else was now needed to trigger interglacials and that something was extreme tidal forces caused by maximum orbital eccentricity. When these coincided with peak insolation in the Arctic Circle the breakup of the northern ice sheets could begin and they collapsed rapidly within one precession cycle. Are these super-tides the catalyst to break up the large northern ice sheets and exit glacials once every 100,000 years? An interesting idea overall; I’ll have to chew on it. I have never understood this fixation with averages. Today the difference in insolation between perihelion and Amphelion is about 60 w/m2. At Maximum eccentricity that number is as much as about 155 w/m2. Couple that with the variation caused with maximum and minimum obliquity (24.5 degrees down to 21.4 degrees), and you could pile up enough snow in the winter that it would not melt in the winter, starting a slow descent into an ice age. This started again about 4,000 years ago and is proceeding quite on time. It seems to me that continental glaciation needs a whole lot of snow, yet the arctic of today is just too dry. Is it possible that our thinking is backwards about the Arctic Ocean ice cover? Perhaps an ice free arctic, with circulation of warmer water of tropical origin (a portion of the Gulf Stream perhaps) is what is really required to transform the arctic literally into a snow factory. Interesting. However, it remains to be explained why there is no signal in ice bubbles or benthic isotopes for the 400kyr cycle, which as you mention is the strongest and most stable of all the Milankovitch cycles. 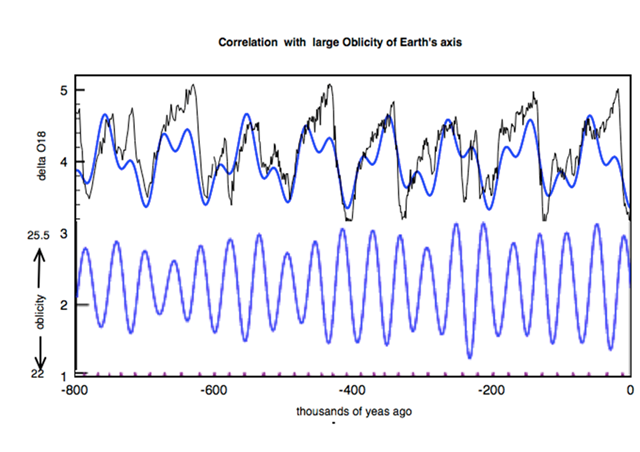 Figure 1b shows the 400, 000 year modulation of the 100, 000 year eccentricity cycle. There is a huge variation in the peak amplitude such that the actual value of eccentricity at the peaks 800kya, 400kya and now are close to or even lower than the troughs of eccentricity at 600 kya and 200 kya. However the remarkable thing is that all the eccentricity peaks of such widely differing amplitude seem to be equally effective in causing abrupt interglacials. This means that the effect of eccentricity cannot be linear. It is acting as a periodic forcing of a nonlinear oscillator. At the highest amplitude peaks of eccentricity 600 kya and 200 kya one can see a more ragged curve of glaciation with secondary smaller interglacials. This may support the idea of high eccentricity causing tidal disturbance of the ice sheets. As can be seen from the second graph in this blog post [that used the NGRIP-based Greenland Ice Core Chronology 2005 (GICC05) time scale] there is excellent agreement between the timing of the DO events and the rapid rise in polar temperatures. Fallacie of dignity shown in those lines – You and many other belive that an icecore can taken on land or in sea can show situation at the same actual spot/gps point for the last ten thousand years or more. That’s not true. First of all water in all forms tries to reach the lowest point. Secondly there is three different errosionfactors -needed to be fit into your analyse. wind- and temperatureerosion as well as erosion due to impacts from graviditation. Why? Ice taken from one level hardly ever have the same density as ice taken from other levels. That we can thank basic Physic as well as the specific phenomena of Volcano eruptions for not to mention wind-directions and strength of long distributed less or more salt procentage in rain/snow falling down. I had a thought similar to that about 4 years ago. I wondered if it was possible for the Arctic to mirror what happens with a lake effect snow off of the Great Lakes. If possible that could be a huge snow event. Imagine a storm that could drop 15 or 20 feet of snow within a day or two, and continue like that for multiple days. The biggest snowfalls that I witnessed were 12 ft in 3 days, and 6 ft in one day, 1970/71 at Lake Tahoe. It took several days to get the roads passable with that much snow. In the Seattle area we seem to have our most painful snowfall when the Pineapple Express rides in over the top of the Arctic Express and warm Pacific rain falls through a very cold Arctic air mass. If this results in so little as a single snowflake falling, a dozen vehicles will spin out on it, three drivers will abandon their cars in the middle of it, 18 people will go to a Starbucks and wait it out, and no less than 10,000 people will tweet it. There will be sixty youtube videos of cars and buses slamming into each other on Queen Anne hill (a largely leftist burb of Jet City. BTW), and RealClimate will describe in slow stifling Algore speak that this is just further evidence of runaway, beyond the tipping point apoplectic anthropoheinous global climate refutation and that our sector of the galaxy is in grave danger from right wing gun thumping white American males as documented by the NYT and the Grauniad, both of whom are legendary centrist publications, just ask them. i know that you are trying to help nora4you. In addition, you have raised some good points which need to be considered when dealing with ice cores. However, the GISP2, GRIP, NGRIP and Dye 2 ice cores were not taken at the North Pole but in the Greenland Ice-cap which is firmly wedged over the Greenland landmass. Hence, many of the concerns you have expressed about moving sea-ice do not apply in this case. Sorry – I misspelled refudiation, there. One of the larger problems facing paleoclimatology is what causes an ice age to end and an interglacial begin. These are the ultimate global warmings, with sea level rising ~130 meters since the last glacial maximum. But it is also the speed with which we emerge from an ice age…. “Recent scientific evidence shows that major and widespread climate changes have occurred with startling speed. For example, roughly half the north Atlantic warming since the last ice age was achieved in only a decade, and it was accompanied by significant climatic changes across most of the globe.” states the opening of the Executive Summary from the Committee on Abrupt Climate Change, National Research Council, 2002, ‘Abrupt Climate Change: Inevitable Surprises’, ISBN: 0-309-51284-0. Whatever causes that packs a big climate punch over a short period of time. What we should all appreciate is the pursuit of a novel mechanism, super-tides, that Clive has done for us here. This is a really good example (I think) of why we are all here. I had never heard of this concept before, and I really appreciate the expose Clive has provided. The thing is, this is exactly the sort of kick-start mechanism that could work on a very short time frame. If correct, this might solve the single largest climate mystery which is what brings us out of an ice age? Again, thanks Clive, your work made my day. Your observations about changes to Arctic and Antarctic ice at certain lunar phases are interesting and could be important. Fig 1a is about, if it’s the same resolution, a long slow global cooling and a treshold that gives increased climate instability. The reason for the global cooling, last 27 million years, could be many things and probably things working together. Even a long slow gradual loss of Earths atmosphere? “900,000 years ago this general cooling reached a critical stage because the increase in spread of ice sheets in the Northern hemisphere became too large to fully melt back during the next peak in obliquity. The cycle of 41,000y ice ages was broken. It appears to me that Clive’s premise is that starting 900,000 years ago, an ice free Arctic Ocean during a time when high axial tilt produces increased arctic insolation, is needed to begin the melting away of NH continental ice sheets during a climate optimum. If the premise were so, wouldn’t we have had an ice free Arctic ocean for the last 12,000 or so years? Or is he suggesting the Arctic froze over again as the Earth’s axial tilt lessened? The view of Maslin and Ridgewell on the “eccentricity myth” should at least be included in a discussion on glacial timing following the mid Pleistocene revolution (change from obliquity to eccentricity phasing). Maslin, M. A., & Ridgwell, A. J. (2005). Mid-Pleistocene revolution and the ‘eccentricity myth’. Geological Society, London, Special Publications, 247(1), 19-34.
characteristics, is not also somewhat misconceived. @fred berple You may be right that the main effect of large tides is to change the ocean circulation of heat through the MOC. If this circulation depends to some extent on tidal strength then this would increase heat flow to the arctic. The effect of eccentricity on insolation is subtle. 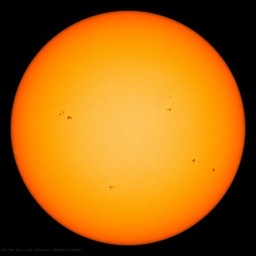 When averaged over a year the direct change in solar insolation is small. However eccentricity modulates the precession term which changes the timing of seasons within the earth’s orbit. Today the perihelion coincides with southern hemisphere summers. In 12,000 years time it will coincide with northern hemisphere summers. As the earth’s orbit heads towards low eccentricity the precession effect goes to zero. You can see this well in Figure 2. When eccentricity is large then so too is the 23,000 year precession term. @goldminor Interestingly enough there was a perigean spring tide at the end of December. This was also the main cause of the costal flooding during the big storms in the UK at threat time. It was a bad storm but the very high tides caused the flooding. @David – sorry for the confusing sentence! I meant the coincidence of the earth being at the shortest distance from both the sun and the moon simultaneously. Thanks for the feedback. I have greatly enjoyed the conversation, exercise, and the mystery of this ongoing search for understanding. Plus, I fully detest the thought that students of all ages, in many places around the world are being fed a false reality under the supposed banner of ‘science’. I have grandchildren being taught the cagw story. Whilst not directly related to the article, I have always wondered what effect tides have on the break up of the annual ice sheet. Living by the sea I know the effects of Spring tides especially when combined with winds from a certain direction. I don’t know if there is a recent paper whereby modern tide heights can be compared. Perhaps someone might have practical experience of witnessing the effect of tides on ice sheets? Is it assumed that the tide rises uniformly? I have witnessed tidal waves. I suppose a 4Mtr wave may break 4mtr Ice. The MOC is indeed mainly a mechanical effect. Winds circulating round Antarctica pump surface water northwards and deep water up from the abyss through Ekman transport. This deep water in the Atlantic ocean originated as dense cold saline water from the Arctic. Tidal forces would add more mixing to the MOC. You have done some great work on matching the D-O events to extreme tides, which I only discovered in the last few days. D-O events are the 25 or so rapid climate fluctuations found in the Greenland ice cores during the most recent ice age. Ian shows that recent ones coincide with what I call above Super Perigean Eclipse Tides occurring every 1832 years. If he takes into account the synchronization with seasons then they match up well. I must admit I haven’t yet understood the maths for this yet. For me the most important parameter to get my hands on is the change in eccentricity of the lunar orbit due to the same (Milankovitch) effects that change the earth-sun eccentricity. I feel this must have been calculated somewhere but I cannot find any reference to it. This will determine just how strong the largest tides were 17,000 years ago. I haven’t seen anyone noting that tidal eccentricities affect the other subsurface fluid, Magma, and also the earth’s plastic crust. Perhaps these periodic perturbations drive shifting Continental movements also. Which then interplay with Oceanic currents. As a layman, I’d be interested in a Climato Geologists take on the question. @Ferd Berple your user name is an anagram, no? Nice thinking out of the box. it certainly contributes to the mindset required to solve the 100k not-milankovitch cycle. But it appears that the real variations in tide amplitude about the full range of orbital variation (less than a meter) is too insignificant to explain the collapse of ice sheets. Furthermore the moon, the most important contributant to tidal forces is receding, which implies that tides would reduce over geological time scales, and not increase as per the 0.9Ma transition from the 41K to 100K world. Looking at several major changes in volcanism, tectonics and deep ocean reorganisations, I would explect that the real cause of waxing and waning ice sheet is below our feet. That is the height of the tidal bulge (in this era) – not the transverse flow near coasts which are much higher. 17,000 years ago the distance of closest approach to the moon and the sun were closer (higher eccentricity). This caused a much larger maximum tidal bulge than experienced today. This is the proposed solution to the 100,000 year cycle of interglacials. One providing information that to a 46 year old Chartered Engineer has taught an old dog a new trick and the latter – one that made him spray Earl Grey all over his monitor. Tectonics is not cyclical and periodic and thus is not a factor in the “current” glacial cycles. In the long term (starting at 10s of millions of years) then yes, tectonics explains most or all of global warmer or cooler phases of earth’s history, e.g. isolation of Antarctica 30 million years ago, the circumpolar current and all the cooling since, together with the separation of Atlantic from Pacific. 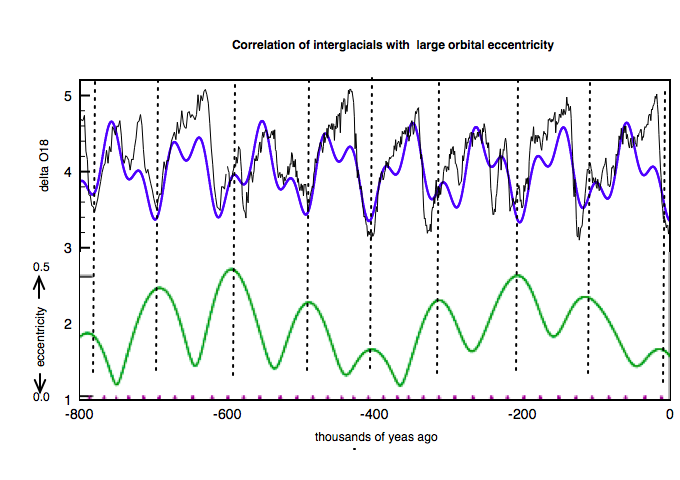 But it cant explain recent cyclical interglacials with 40-100 kyr periodicity. Any evidence that it isn’t? It is the oceans not the ice that matters. I’m not convinced. Nothing seems to fit nearly as well as suggested. It seems to me this is good thinking, good information to add to our investigation, but it really sounds like we are saying that we are seeing a cloud in the shape of a bunny. We humans are good at seeing patterns and likenesses, but we are still good at seeing such even when not actually there. Now, how can you be so certain? Did volcanoes stop? Did earthquakes stop? Did up heaving up of the crust stop? When we started using pre stressed concrete floors in high raised office building, floor tile was popping off the floors like popcorn. Why? The thinset (type of concrete glue) bonding the tile to the floor could not handle the mass amount of small vibrations caused by a lot of people walking on the pre stressed floor at the same time. The Dansgaard-Oeschger event timing and the“1478.00 years (= 2 x 739.00 years) to complete the cycle where a New Moon occurs when Perigee points at the Sun at (or near) Perihelion” is quite interesting. E.M. Smith mentions the travel of the moon’s effect in a north-south direction. Lunar Cycles, more than one… He has some pretty good illustrations that are worth the visit. So … the Storegga slide which happened 8200 years ago caused the Holocene interglacial which started 12000 years ago? OK … and the synchrony of several dozen interglacials with the obliquity cycle before the MPR and 8-9 interglacials after the MPR with the eccentricity cycle – all this is just coincidence? who propose that following the MPR obliquity and precession were no longer able via insolation alone to terminate a glacial but the build up of ice eventually triggered some event which caused an interglacial. They had more in mind interference with ocean currents but big mudslides might serve equally well. But this picture fails to address the continued synchrony with both eccentricity and precession. Please notice that the maximum eccentricity in the 400k cycle is 0.058. With some mild math I get to calculate a 11% difference in solar-earth gravity (hence squared) between perihelion and aphelion. Now the current tidal gravity force is 54 cm from the moon and 25 cm from the sun according to my wiki link. With 11% variation at maximum milankovitch eccentricity the solar gravity part account for 25 +/- 1,4 cm, if the relationship was to be linear, a variation of roughly 3.5% of the total tidal variation of 79cm. Even assumining non linearity, It’s hard to imagine how a 3.5% variation in sun-moon gravity forces can account for super tides with the M2 tidal constituent. The tidal force goes as 1/R^3. The effect of eccentricity = 0.058 is plotted in Figure 4 above. For the sun this gives a 20% increase at perihelion and a 25% decrease at apehelion. Spring tides would be just 10% larger if the much larger lunar component were to remain constant. However the lunar component doesn’t remain constant and any change in moon-earth ellipticity has a far larger effect on tides because the moon is much nearer. If the eccentricity increases by the same proportion as that of the sun then spring tides are 60% greater in magnitude than today. Here I am asking for help. I would like to get hold of any data on “Milanovitch” effects on the lunar orbit. In particular how has the effective eccentricity of the moon-earth orbit varied over the last million years. I can find no reference to this on the internet. If it can be calculated for the earth then it can be calculated for the moon. The whole hypothesis depends on a significant change in lunar eccentricity with the 100,000 year cycle of planetary gravity effects. Notice that Bryn et al mention a 100ky cycle in tectonics, where the only objective was to demonstrate cyclicity in tectonics. Hence the storegga slide is a strawman. But maybe have a good look at Lohne et al 2007 about sea levels in Norway to see a wider interconnection. …I fully detest the thought that students of all ages, in many places around the world are being fed a false reality under the supposed banner of ‘science’. I have grandchildren being taught the cagw story. So challenge them. Nothing like learning young to question authority. This is quite interesting. The correlations are impressive. Tides could break up sea-ice and even ice-shelves if high enough. Won’t affect purely continental ice, but aligned w/high-latitude solar input, could be the “trigger”. Need time to grok….. In 4. I assume you meant “interglacial” and not “ice age”? Also, how can the the force of sun’s gravity on the moon be 2X larger than that on earth? It’s a function of distance and mass. Since the moon and earth are essentially the same distance from sun and earth is much more massive, I think you need to reword that sentence as well. In the long section near end (2nd to last section). 2. What I mean is that the gravitational force of the sun on the moon is twice that of the earth on the moon. The moon is really in a perturbed orbit round the sun when observed far out in space. This post will leave Anthony and Willis, the two upright cyclefighters, with gnashing teeths…. ….Cylcemania is rising its head again….10 times worse than Hansen-Warmism! Nèst-il pas? In particular how has the effective eccentricity of the moon-earth orbit varied over the last million years. Consider that the moon and earth both orbit the sun, and the eccentricity in the lunar orbit around the sun will vary in magnitude and timing similarly to the earth’s max eccentricity = 0.058. So long as these are in phase, then the net earth-moon eccentricity would be close to 0. However, if they were out of phase it seems possible that the net eccentricity could be as much as 0.116 at 180 degrees out of phase, and some sin/cos function in between. However, that number is calculated from the distance from earth to the sun. 0.116 x 93 million miles = 11 million miles, which would be quite something given the moon is on average only 240,000 miles from earth. So, it would seem likely that the moon’s and earth’s orbits around the sun must also be gravitationally bound to remain in sync with each other, otherwise the moon and earth would eventually collide, or the moon could be thrown out of orbit around the earth. However, it seems likely that this is not a perfect sync, that the earth’s and moon’s orbits around the sun will alternately lag and lead each other in some sort of complex harmonic oscillation due to orbital mechanics, and could at times become quite large, leading to a large net eccentricity in the moons effective orbit around earth. And it seems likely this net eccentricity could be maximized at times when eccentricity of the earth’s orbit around the sun is maximized. Something like the motion of a pendulum clock. The amplitude of the pendulum is the eccentricity, and the irregularities in orbital mechanics provides the excitation force. When the excitation force varies in phase with the natural period of the pendulum, the motion can become quite large for even a small excitation force. You forgot the Johnnie Walker. Likely well within the uncertainty for DO events. this number appears to assume that earth-moon eccentricity remains constant, which is perhaps unlikely. something else to keep in mind is that the tides on earth do not act in a linear fashion with the tidal forces. they are more like the action of someone pushing a child’s swing. When in-phase the resulting motion is much greater than the exciting force. Thus we routinely see tides much greater than 79cm as would result from gravitational/tidal forces alone. the tides act somewhat like a shallow bowl of water, where you tip the bowl slightly. If you get the motion of the bowl in phase with the motion of the water, the water will each quite high up the sides of the bowl. There’s a scaling error in figure 1b. The range of eccentricity is up to 0.05, not 0.5.
something else to keep in mind is that the tides on earth do not act in a linear fashion with the tidal forces. for this reason we do not calculate tides using first principles – because it is not accurate. rather, we use astrological methods, which give a much more reliable result. the problem is that astrology has been misused as a pseudo science, when in fact it has a long history of reliable prediction when used appropriately. early humans used astrology to predict the seasons for thousands of years before they could do so from first principles. we should keep this in mind when dealing with climate. That graph is wrong. The NOAA calculated data for eccentricity is plotted as the top curve in figure 2 and it aligns pretty well with interglacials as shown in Figure 1b. The Keeling paper on an 1,800-year oceanic tidal cycle sheds light on my discussion with Dr. Svalgaard on the reality of Bond Cycles, the hypothesized extension into interglacials of glacial D-O events. Thanks for posting it. If you go back to the start of the current interglacial you will find that obliquity was at maximum and NH summer was at perihelion. Obviously those two conditions must be present for an interglacial to begin. Those two conditions had last occurred together prior to this interglacial about 132k years ago, which was the start of the Eemian interglacial. I think you will find that, working back in time, interglacials begin when these two parameters are aligned properly. The amount of eccentricity at the time when the other two align provide the added condition to determine the actual start, length, strength and end of the interglacials. If you go back to the start of the current interglacial you will find that obliquity was at maximum and NH summer was at perihelion. Obviously those two conditions must be present for an interglacial to begin. correct – but if only it was that simple. Those two conditions had last occurred together prior to this interglacial about 132k years ago, which was the start of the Eemian interglacial. No – another one just as large occurred 80,000 years ago and there are plenty of others that occur within a glaciation but do not trigger an interglacial. Interglacials only occur every 100,000 years. Before 1 million years ago you were right that maxima in obliquity was sufficient. Click on figure 2 for more details. The solid black curve shows the NH summer insolation. The moon used to be closer to the earth than it is now. I don’t know how much closer 5-million years ago, but perhaps this helped keep glaciation at bay. Excluding the cluster of Dansgaard-Oeschger events 5 to 7, there is no 1470yr periodicity. It is most likely that these three events arise from intermittent 1542yr (+/-179yr) interval peaks in solar activity. Figure 1b shows exactly the same thing, i.e. the last peak in eccentricity was less than the low point around 150Kyr BP. I just can’t leave this one alone. 2) The fact that total global insolation varies little is irrelevant since earth albedo is highly asymmetrical. 3) Of course gravity and insolation are both 4pi functions with corresponding variation. Milankovitch cycles obviously control ice ages by way of insolation, not gravity. 4) Ice caps occur over land, not sea. How are tides supposed to affect them? Your link shows that the eccentricity of the moon relative to earth is easily influenced by other planets. Right, I suppose 364,000 km is the elliptical perigee, which is perturbed to as much as ~356,000 / ~370,000 km by the other two orbs. The Moon’s orbit is amazing, like an elastic thing continuously being stretched and played with. 4)Yes glaciers on land do experience tidal forces. Of course it depends how strong they are. Average open-ocean normal tide level change (low-tide to high-tide level) 3 feet. Depending upon the coastline configuration, some of these perturbations also cause major currents in addition to the sea-level impact. Presumably ice sheets are subject to surges of this type – even attenuated by distance – many times each century. Is it reasonable that a relatively-small fluctuation of 3 feet every so many kiloyears would make much difference? One of the most interesting discussions ever. It challenges the mind and further reflects the complexity of events that may affect climate. I have wondered about the independently (?) chaotic events and their potential impact should random occurrence coincide. Here’s a what-if for thought. The ENSO/PDO is in warm phase with AMO. The warm water moved to the Arctic thins the ice. A major quake occurs in the Alaskan or Icelandic areas and a tsunami equivalent to that in Japan occurs during late summer. At the same time a major Arctic cyclone develops. The sea ice in the Arctic could have broken up and disappeared very quickly in 2012, and once lost could take a long time to re-establish. If all this coincided with the tidal cycles discussed herein, rapid change might be induced. That’s a lot of mights and what-ifs – but food for thought. As “beng” says – grok time. Yes you are right ! But we don’t know how the moon’s eccentricity varies and this is the missing piece of the jigsaw. When the glaciation cycle is at low point in the 400,000 year cycle it seems to be more difficult to trigger an interglacial – the last one and the similar one 5 cycles earlier have strong sawtooth shapes. So for the tide hypothesis to work the lunar component is essential. The solar tide component is smaller. I cannot find any information about long term (Milankovitch) variations in lunar eccentricity. One major problem with this hypothesis is that eccentricity also directly impacts total annual insolation. Total annual input energy goes like 1/sqrt(1-e^2). So, the peaks of eccentricity are peaks of total insolation not just tides. You would have to tease apart those effects. Assuming constant sun, the range of eccentricity forcing is from 0 (arbitrary) to about 0.4 watts (surface average). Which describes a similar (and visually quite reasonable) curve fitting exercise from a couple of years back. Clive, the burning question is what year do we expect to see the beginning of the next interglacial or glacial period? This should be perfectly predictable if this information is correct. January 15, 2014 at 5:11 am…. I’m not up that early, but I guess it’s a time zone problem. Anyway you speculate about resonance in the three body problem Sun Moon Earth, which may or may not be the case. I could also imagine that the outcome would be that the moons orbit pertubations counteract the effect of greater eccentricity of the earth orbit. Obviously when the sun is at a closer perihelium, you’d expect the moon also at higher eccentricity in counterphase to balance gravity. But that’s a wild guess. Let’s not forget we’re just at step one of the scientific method here: “Guess”. Additionally, tides are strongest in those latitudes passing under the Sun and Moon each day. This is why tides are the highest and lowest of the year in the NH at the new and full moons closest to the summer solstice. Having the sun high in the sky matters more than the Earth being at perihelion (which currently occurs during NH winter). North of the Arctic Circle the sun is never high in the sky, even at maximum axial tilt. Thus the tidal effects in the Arctic are always negligible. And I join him by asking: How would loss of Arctic Ocean sea ice facilitate melting of continental ice sheets? “North of the Arctic Circle the sun is never high in the sky, even at maximum axial tilt. Thus the tidal effects in the Arctic are always negligible. No it is exactly the opposite. The tidal bulge aligned under the moon is not because of the direct gravitational attraction – this is tiny. It is the tractional force piling up water from the edges into a tidal bulge. That is why the strongest tides on earth are at high latitudes. The bulge on the other side is due the centripetal force of the earth’s rotation about the Earth-Moon centre of mass. Interesting hypothesis. I was confused by whether or not you meant that systematic supertides cause the interglacials, or the glaciation. Only the former would make sense, right, but you assert several places that they are coincident with glaciation, I think as typos. It also cannot (IMO) just be a supertide that breaks up the ice all at once and causes an interglacial — it might well be that tidal height varies systematically with orbital eccentricity and eventually reaches a state where the average spring tides break up the ice regularly enough to trigger the kind of positive feedback you assert. That suggests that there might be some sort of critical point in average tide height that favors the transition(s) in both directions. It would also be interesting to see if the occurrence of supertides over the last 20 years was asymmetrically distributed between Northern and Southern hemisphere summer and winter. It was suggested that a rare coincidence of more of these events than usual over the last 20 years is responsible for the decrease in average Arctic sea ice over that interval (or is otherwise correlated with the years where minimum ice occurred), but in the meantime Antarctic ice has actually grown. For the assertion to be consistent, one would need a matching asymmetry in the distribution of the timing of the supertides and the hemisphere, and actually it wouldn’t hurt to specifically correlate years and even dates in which the supertides occurred and specific sea ice anomalies. It isn’t like a supertide in 2003 is going to cause an ice anomaly in 2005. Finally, tidal forces can be correlated with other things besides ice breakup — e.g. volcanism. Again things I don’t know or don’t even know where to look for, but is there a geological/historical measure of “net global volcanic activity” vs “contemporary eccentricity of the Earth’s orbit”? Volcanoes could easily be the trigger of glacial/interglacial transitions also, as they modulate both GHGs, soot/ash, and aerosols. Looking for correlations here on any time scale whatsoever would be useful, although I’m guessing that there is damn-all data past maybe 200 years (roughly, Tambora). If there was a burst of supertides over the last two decades, were they warming or cooling? Did they increase or decrease volcanism (potentially, given correlation)? I’m not convinced by your argument — not yet — but it is certainly plausible. However, there are other things associated with the extremes in orbital eccentricity, such as extremes in peak versus minimum annual insolation and just where/how it hits the pattern of continents on the Earth in the two hemispheres, that are alternative explanations that would obviously have similar timing, and of course it could be that there are multiple explanations, any two out of three conditions favor the start of an interglacial, that sort of thing, that might explain why no particular explanation has perfect correlation. The same sort of thing is true for solar state as a correlate of climate. Even if it is an important cause, it is one of many and it may be that sometimes the stars align for it to “work” and other times they are aligned such that it DOESN’T “work” to effect some particular change. Low solar state (Maunder minimum) AND high volcanism AND a deficit of supertides that causes polar icepacks to grow over 20+ years (with effects stretched out to 100+ years as supertide rates return closer to “normal”. Everybody looks for correlation one dimension at a time, but the climate trajectory is very likely ten or twenty important dimensional as well as being nonlinearly coupled and chaotic in its local dynamics. But still, interesting idea. Sorry – Yes I am only addressing interglacials. I agree there is another unsolved issue as to why exactly the earth then gradually cools to enter a new glaciation. The evidence would suggest that this cooling phase for the next ice age should begin within the next 1500 years. Perhaps keeping CO2 levels above 400ppm until then might be our salvation ! I agree that it would be a long process whereby average spring tides increase to a level that slowly undermines ice sheets rather than just one super-tide. There has also long been a suspicion that tidal forces acting on the lithosphere might trigger earthquakes and vulcanism. There are also a number of volcanoes in Antarctica. So far as I know no climate model includes any tidal effects at all. They are assumed to be negligible. Nor do any of the paleoclimate studies. I think it is the case that the reason the PDO/ AMO swaps on a quasi-3-Saros basis is that it takes 3 periods for the lunar tidal forces to be back over the same ocean at the same point in the Saros cycle. I think it likely that other resonances with lunar tidal cycles will be found. The Antarctic Circumpolar Wave looks to be running on about 1/2 a Saros frequency. Likewise The 18.6 year precession changes the tidal latitude extent of the tidal bulges which could effect the jet stream. The last perigrean spring tide occurred at the end of december. This was the main reason for the coastal flooding in the UK, rather than the storms were not that unusual for the Atlantic. So the sawtooth pattern over a 5.3 million year span is not cycles it is just random chaos HMMmmm? There are no such things as laws of physics either I take it. Everything is chaos with no rhyme or reason. That 1/R^3 force can be worked out by a high school algebra student. Here’s where it comes from. Let the distance of the sun from earth be R, radius of earth be r.
(Rr)^2 is only 1/3600 the first term, R^4 . …4)Yes glaciers on land do experience tidal forces. Of course it depends how strong they are. Thanks for the discussion, good thinking still. It’s Obvious that the earth tidal amplitudes are subject to significant variation. However the question remains if that would be sufficient to explain all the features of the glacial transitions that are NOT discussed this far, apart from the effect of tides on landlocked ice as mentioned herein. For instance, how to explain the massive reorganisation in deep benthic ocean settings, that caused the gigantic CO2 burp (Marchitto et al 2007 http://www.sciencemag.org/content/316/5830/1456 ). But on the other hand, resonance at a certain point could very well explain the thus far (not really explained) Meltwater Pulse 1A, not meltwater but excessive tides. What I found interesting was the North-South tidal component that E.M. Smith unearthed. If this is real, and the different locations of eclipses indicate that it is, you could have a long slow “tide” driving the oceans first away from the equator and then back towards the equator. Given the lopsided arrangement of land masses this could have some very interesting effects on the oceans and currents. On the longer term, the exact alignment of the moon and earth has the moon drifting more north and more south on a very long cycle. That will slop water more north and more south (and influence things like the Circumpolar Current depth and the Antarctic Circumpolar Wave http://www-das.uwyo.edu/~geerts/cwx/notes/chap11/ant_wave.html that runs in about a 1/2 Saros cycle. So there are opportunities for many interactions with land forms and ocean bottoms, winds and atmospheric tides too. It takes between 1226 and 1550 years for the members of a saros series to traverse the Earth’s surface from north to south (or vice-versa). These extremes allow from 69 to 87 eclipses in each series (most series have 71 or 72 eclipses). From 39 to 59 (mostly about 43) eclipses in a given series will be central (that is, total, annular, or hybrid annular-total). At any given time, approximately 40 different saros series will be in progress. I find those two numbers fascinating. First off, we’ve got a number rather close to Bond Events. 1470 +/- a couple of hundred and often stated as 1500 years. So at one end of the longer Saros Series length. With an error band of about the distance to the other end of Saros Series length. Then we’ve seen various “about a 1000 years” patterns in weather history and human history from that. Very near the other shorter end of the Saros Series. Clive that first link was link It has a listing of all the lunar essays by E.M.
Cant find your paper! What do you suggest causes the said rearrangement of the North Atlantic currents? Weather and climate have been going through (increasingly?) wild swings for the past few million years. That much we know. In any case, the end of the movie may not be “they lived happily ever after.” We need to get serious about an exit strategy. Space really is the final frontier. If I thought that science or physics had anything to do with any of your suggestions and posts I would would look them up. You seem to be correcting everyone except yourself. Try looking at the fifth figure of this post before you start mouthing off. I have ‘planted by the moon’ for many years now. There is no question in my mind that there is superior results when following the moon cycle. It seems to me that if tidal strength influences glacial cycles (which is a very interesting idea), then the effect would probably be through the breaking up of shelf ice areas. Much of the Arctic Ocean and North Atlantic is covered by shelf ice during glaciations, and breakup of this would have a destabilizing effect on the surrounding continental ice sheets. Existing shelf ice areas are known to be strongly affected by tidal effects. There is evidence that the strongest tides are involved in triggering earthquakes and volcanoes. There are also several volcanoes in and around Antarctica. It might very likely be that breaking up the sea ice allows more water to be exposed to the sun and store more energy. Over time, this would have a substantial negative effect on the land-based ice. I’m sure I calculated that if you go from absolute zero, then the oceans store the equivalent of one whole year’s worth of solar energy received by the Earth. A huge amount. By the way, great thread. Thank you, Clive Best. For those wondering about land ice, the Milankovitch cycles are intimately connected to both the tidal forces AND hemispheric insolation summer maximums. When they align in the northern hemisphere, the tides can work on sea-ice/ice-shelves and the insolation on land ice at the same time. Puts cold water on MILANKOVITCH CYLES AND TIDAL EFFECTS. They are to slow to account for the many sudden temperatures swings, and even more telling temperature swings within a cold interval such as the Younger Dryas. 1.Berger, W. H. (1990). “The Younger Dryas cold spell – a quest for causes”. Global and Planetary Change 3 (3): 219–237. Bibcode:1990GPC…..3..219B. doi:10.1016/0921-8181(90)90018-8. 2.Alley, Richard B. et al. (1993). “Abrupt accumulation increase at the Younger Dryas termination in the GISP2 ice core”. Nature 362 (6420): 527–529.Bibcode:1993Natur.362..527A. doi:10.1038/362527a0. 3.Choi, Charles Q. (2 December 2009). Big Freeze: Earth Could Plunge into Sudden Ice Age. Interestingly, the Younger Dryas began at about the same time as the Gothenburg magnetic reversal. My thinking is that since the Arctic Ocean never enters the region of the Earth’s surface that the Sun is drawing water towards, the Arctic Ocean is never on the receiving end of tidal currents. The Sun only draws water away from the Arctic, as it circles the horizon. Yes, the strength of the Sun’s draw upon the Arctic waters would vary with the sun’s elevation and distance, but there would be a corresponding, though opposite in direction, draw toward the tidal bulge on the far side of the Earth. Thus, also, no back and forth tidal currents as the Earth rotates. This all also applies to the Moon. Most of the time the moon’s draw upon Arctic waters would be out of alignment with the Sun’s, but even when aligned, the draw of the opposite side tidal bulges would also align. Of course, this drawing away effect has its limits, or the Arctic ocean would be dewatered. 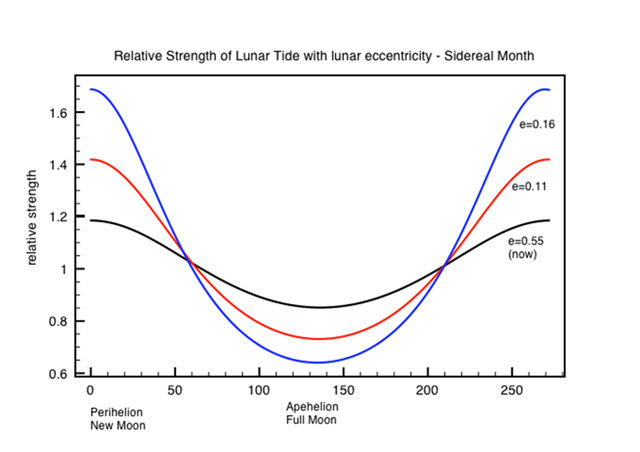 Once the limit is reached, tide level would be essentially static, with only slight variations in the strength of the draw due to the orbital eccentricity of the Earth and Moon. Furthermore, the Arctic Ocean is nearly landlocked. Note how being landlocked stifles tides in the Mediterranean Sea, despite its much lower latitude. It is hard to imagine how minuscule variations in minuscule tidal currents could have anything other than a doubly minuscule effect on sea ice in the Arctic. However, the bigger question is how a loss of Arctic sea ice, by whatever means, could cause melting of continental ice sheets. At our current axial tilt, even the summer sun is too low in the sky in the Arctic for insolation to overcome the heat loss due to evaporation. 1.5 more degrees of elevation would not change this. Evaporation from open water in the Arctic Ocean would increase snowfall upon surrounding continents, contributing to ice sheet mass. Cooling due to this evaporation, combined with radiation and conduction to the atmosphere, would quickly refreeze the Arctic Ocean during the next winter. The only way to get, and keep for more than a season, an ice free Arctic Ocean is to have a large supply of warm water, but this would result in growth of continental ice sheets. Beng, Clive was noting that increased insolation due to Milankovitch cycles was not enough by itself to melt land ice, as that ice apparently persisted through some periods of highest insolation. I note that something other than Milankovitch cycles must be the cause of glacial onset/decline. Clive does wonderful work. His search into the missing components of Milankovitch cycles is always thought provoking. Lunar variations may be one of these elements that give an added push to the eccentricity in a key phase of the ice age cycle. Consider the role of the very hot Local Bubble just outside the sun’s heliosphere. The elongated elliptical orbit may contribute to the heat and energy of the sun during a maximum eccentricity. A number of things could have caused it — including things nobody has even thought of for which the evidence was long ago erased by time and entropy — but AFAIK nobody has a quantitative theory that can explain it or predict things like interglacial triggers, MWPs, LIAs, and so on. Perhaps because theorists want a “smoking gun” cause, a single big cymbal crash that changed things, where nature may work with syncopated chaotic lemmings playing first a hot jazz riff on a dozen different strings, then a cool one. Abstract: A recent analysis of a Lunar Laser Ranging (LLR) data record spanning 38.7 yr revealed an anomalous increase of the eccentricity of the lunar orbit amounting to de/dt_meas = (9 +/- 3) 10^-12 yr^-1. The present-day models of the dissipative phenomena occurring in the interiors of both the Earth and the Moon are not able to explain it. We examine several dynamical effects, not modeled in the data analysis, in the framework of long-range modified models of gravity and of the standard Newtonian/Einsteinian paradigm. It turns out that none of them can accommodate de/dt_meas. Many of them do not even induce long-term changes in e; other models do, instead, yield such an effect, but the resulting magnitudes are in disagreement with de/dt_meas. In particular, the general relativistic gravitomagnetic acceleration of the Moon due to the Earth’s angular momentum has the right order of magnitude, but the resulting Lense-Thirring secular effect for the eccentricity vanishes. A potentially viable Newtonian candidate would be a trans-Plutonian massive object (Planet X/Nemesis/Tyche) since it, actually, would affect e with a non-vanishing long-term variation. On the other hand, the values for the physical and orbital parameters of such a hypothetical body required to obtain the right order of magnitude for de/dt are completely unrealistic. Moreover, they are in neat disagreement with both the most recent theoretical scenarios envisaging the existence of a distant, planetary-sized body and with the model-independent constraints on them dynamically inferred from planetary motions. Thus, the issue of finding a satisfactorily explanation for the anomalous behavior of the Moon’s eccentricity remains open.